I will follow you...the yellow man is follow me to Kenyalang Park! A new DiGi Outlet launching at the Kenyalang Commercial Centre this morning. I saw crowded when loud music on. 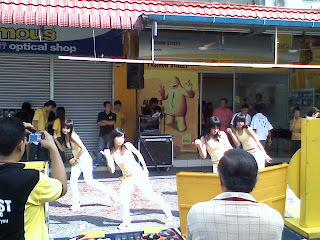 A group of four young lady did a very good job on dancing to attract more DiGi follower. Free foods and drinks was served but my tummy was just filled with a plate of plain Char Kuey Tiaw at the nearby famous coffee shop. Good to see follower of Yellow Man around but where is the Yellow Man?? ?